Flying Pig Marathon | Run S.M.A.R.T. After using the 18 week program you designed, I pulled up at the Carmel marathon on mile 18 (on BQ pace with the pace group at the time) with a huge blister and was forced to walk off the course for the first time in a race ever. Undeterred, I signed up for the Flying Pig the next day and finished it this weekend – 3:09:05 for both a PR and my first BQ time! What’s Your Spring Marathon Plan? Run SMART client Erin Strout flexing her way down the home stretch to a new PR at the 2010 Boston Marathon. 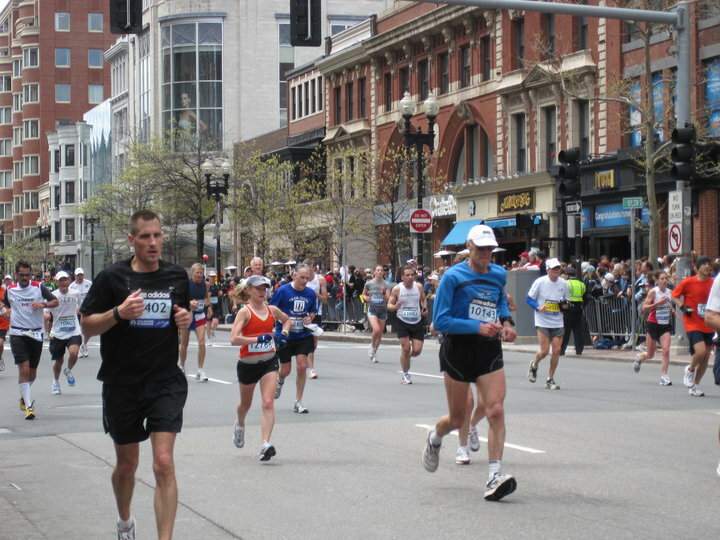 We’ve compiled a list of the most popular spring half and full marathons our clients are doing in 2014 if there’s still enough time to customize a plan on our new app. We’ve also included when your custom training plan would start for each race. If you don’t have a race scheduled yet sign up and customize your plan before the dates below. Any questions about which race would be the best option for you please email us at [email protected]. Lisa Mire Runs PR at Flying Pig, Again! Lisa Mire ran a personal best at Flying Pig for the second year in a row! Lisa’s new marathon PR stands at 3:16. She ran almost dead even 7:25 mile splits through 22 miles. The best part is she finished feeling good and has recovered well. Lisa’s consistently throughout the winter paid off, not only in her performance, but in her recovery as well. On May 4th Lisa Mire and Melissa Bell lined up for the Flying Pig Marathon in Cincinnati, OH. Both women traveled from Charlotte, NC with the intention of setting a personal best at the distance, and so they did. Lisa ran near even splits throughout the race to set a new PR of 3:17:38. The time bested Lisa’s previous marathon PR by 5 minutes 21 seconds. Melissa went out at a slightly faster clip, coming through the first half of the race on 3:10 pace. Though she started to feel the fast early pace around mile 16, Melissa stayed tough and finished in a very strong time of 3:19:12. Melissa bettered her previous marathon best by over 20 minutes. The race was not without its share of drama this year. As it turns out the course had to be rerouted due to an “early morning fire emergency.” The course ended up being .2514 miles long. The times above reflect Lisa and Melissa’s adjusted times. We’ll call the extra quarter mile a cool-down.